Our designers will design any VPP Banner you need. OR, add the VPP or VPPPA Logo to ANY of our banners - Free. Are you a VPP Site?? Are you shooting for the VPP Star?? 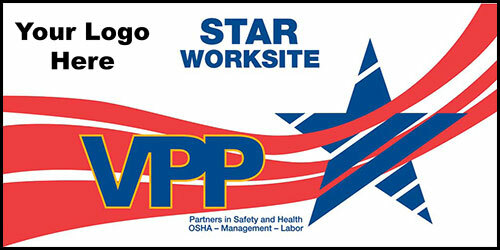 Do you have your VPP Star Site Status. Want to put YOUR COMPANY LOGO on a VPP Banner?? We can do it all. The OSHA VPP boys love VPP Banners. 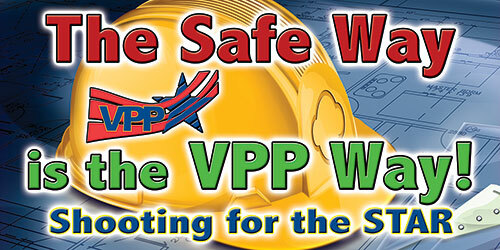 More than one site has told us that OSHA likes to see those "Welcome to Your Next VPP Site" Banners. It demonstrates a commitment they say. Part of the OSHA VPP program involves visible posters and banners promoting safety awareness and the VPP Program. That is where our VPP Banners and VPP Posters can help. We have many standard VPP Designs and more VPP Banner designs on the way. Check back often to see our VPP Updates. 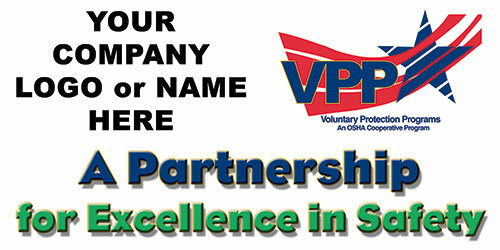 Need a State VPP Logo banner? Yes, we will design those VPP Banners for you also. The OSHA VPP program now has over 2,000 VPP Sites. Each site has demonstrated a commitment and partnership to achieving and maintaining the safest possible work environment. 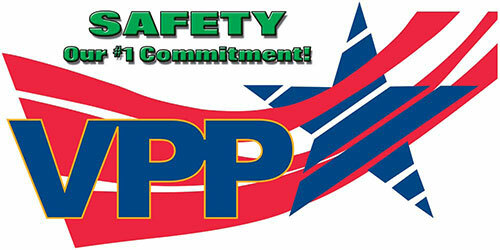 Our VPP Banners will help you show both your employees and OSHA you are committed to the VPP program. Need some custom VPP Banners or Posters? Our designers will put together a banner or poster of which you will be proud. Call us at 901-759-0932 for help with your VPP Banners and VPP Posters. * If the requested design meets our criteria of being resalable on our web site and is approved by our management. If not approved, there will be a design charge for which we will give you a firm price quote. Also, a firm order must be placed prior to any free custom design work being started. We are proud to be the largest supplier of VPP and VPPPA banners to American OSHA VPP sites. Thank you for making us #1.